And so, after many years, Singapore's Butterfly Checklist has passed the 300 mark once again. The early authors had recorded at least up to 361 species (Ref : Butterflies of the Malay Peninsula and Butterflies of West Malaysia and Singapore), but many have gone extinct or have not been reliabily seen in the past two decades. At the same time, many new species not recorded by the early authors have also be documented and added to the checklist. It was a memorable outing for ButterflyCircle members on 26 Feb 2011. It was on this day that BC members re-discovered the Wanderer. 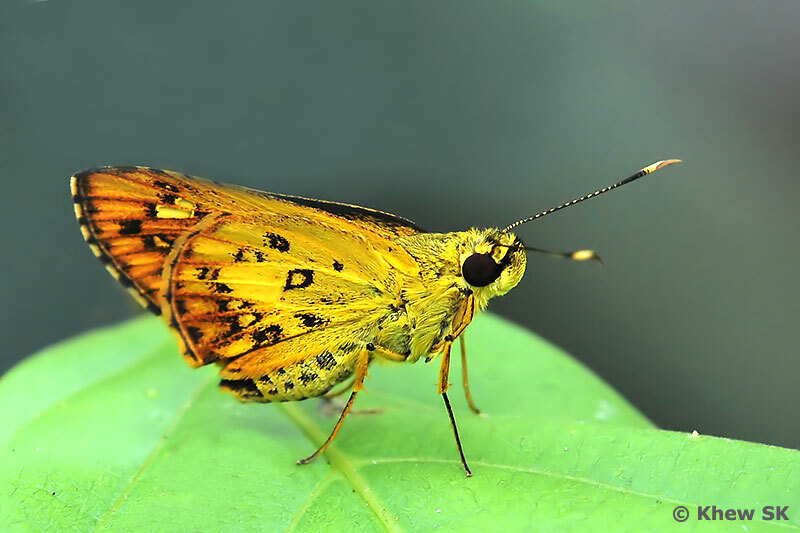 Amidst the excitement of finally seeing that elusive species in Singapore, there was another less attractive butterfly that was shot by BC member Simon Sng. Coincidentally, this outing was organised by Simon and it is a well-deserved 'prize' that Simon bagged with the shot of this skipper which will be recorded as Singapore's 300th species. Although Simon's record shot was not of his usual standard of photography, it was sharp enough to show that this species was not anything that has been seen in Singapore before. The deep yellow undersides marked with rather distinctive markings revealed that this was a species that is new to Singapore. With this species, we have reached the 300 mark - a long way from the time when veteran Steven Neo started recording a checklist for Singapore in the early 90's. 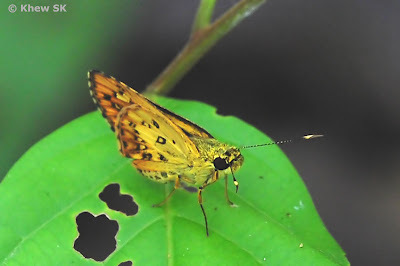 Species that Steven documented, like the Red Base Jezebel, Common Pierrot and Pointed Palmfly, to name a few, have yet to be seen again in Singapore since the days he was active in maintaining the Singapore Checklist. Steven and I co-wrote a paper in the Gardens' Bulletin Singapore, a refereed journal by the National Parks Board in 1997. The paper, entitled "Butterfly Biodiversity in Singapore with Particular Reference to the Central Catchment Nature Reserve" was published in Issue 49 (1997) of the Gardens Bulletin. The paper appears on pages 273-296 of the publication. Back then, armed with film SLRs and a net, we managed to record only 236 butterfly species in Singapore. With the growth of ButterflyCircle's membership in the 2000's and especially after 2005, and over the past 5-6 years, we have added a total of 64 additional species to the Singapore Checklist. With more eyes (and sharp lenses) over the years, and hardworking members of ButterflyCircle have added a number of rare species to the Checklist. When ButterflyCircle launched its Field Guide to the Butterflies of Singapore in Oct 2010, we had reached a total of 296 species. 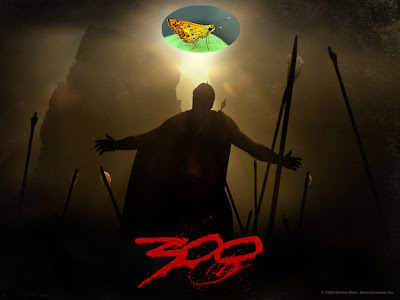 Coming back to our little "Spartan" species #300, - Long-time butterfly photographer, Simon knew at once that he had shot something different, though the butterfly sped off after he shot it. When Simon showed me the skipper, I was also stumped as I'd never seen this species before in my years of collecting and studying butterflies. At BC's forums, other experts joined in and we narrowed it to a Salanoemia sp. with the closest recorded species being Salanoemia similis in Malaysia. 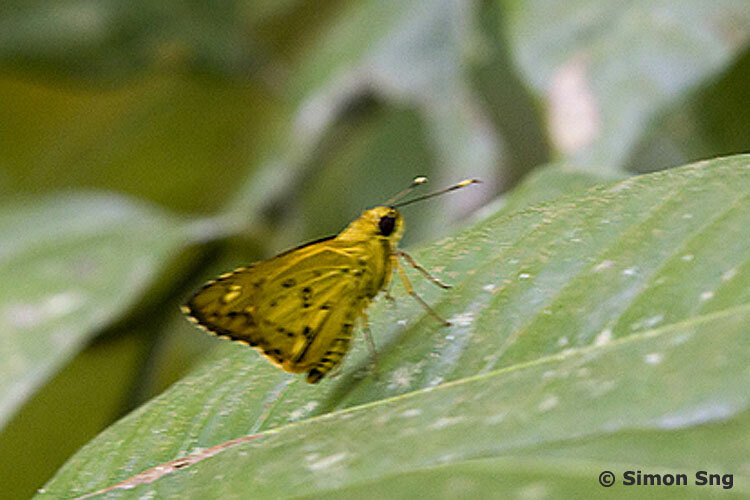 Determined to nail down the ID of this mystery species, I went to the same location on Pulau Ubin the next day, and after about 3 hours of searching, the yellow skipper zipped right in front of me. With better shots of the skipper, we concluded that the skipper is a Yellow Streak Darter (Salanoemia tavoyana), as the distinctive markings of this individual puts the ID well beyond doubt, after cross-referencing to various books and internet resources. What is surprising is that C&P4 states that this species is found in Kedawi (Kedah and Langkawi in the north of the Malay Peninsula) and Myanmar. How it appeared so far south of its normal geographical distribution is beyond our comprehension. We found a caterpillar near the location where this individual was shot, so we hope that we may have discovered the early stages of this species as well. 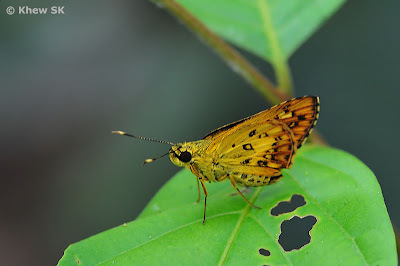 The pristine individual observed suggests that it may have eclosed recently, and is definitely not the condition that a butterfly would be in, if it had migrated to Singapore after a long flight. So will we see more of this species in future? It's anybody's guess. 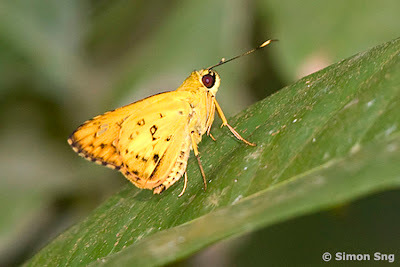 But in future, we will surely take a second look at any yellow skipper that flies in our paths. So Singapore welcomes its 300th species on 26 Feb 2011. There will certainly be more to come, and we have already confirmed the existence of species #301! Watch this space! [C&P4] The Butterflies of The Malay Peninsula, A.S. Corbet and H.M. Pendlebury, 4th Edition, Malaysian Nature Society. Special thanks to Dr Laurence Kirton of FRIM for his comments on the ID of this species.